A sole proprietorship is a single-member business that’s never formally incorporated with a state filing. Sole proprietorship pros and cons include that It’s easy to set up, but there’s no distinction between business and owner and no liability protection. Sole proprietorships minimize startup costs but won’t help you limit your personal liability. Regardless of how you structure your business, it’s important to separate your business and personal finances. Commingling funds can create huge accounting, tax, and liability headaches. Our review of the best business banking options put Chase at the top. New customers can qualify for a $200 bonus. A sole proprietorship is the easiest type of business to implement. It requires no formal setup, no annual administration, no dedicated business taxes, and no formal record keeping. In a sole proprietorship, you simply start selling goods or services – all bills and debts are your personal responsibility. All business income is considered pass-through and filed on your personal tax returns. Because a sole proprietorship is not a formal business structure, there are no filings or paperwork for you to complete before you get started. You simply start operating and don’t have to pay any incorporation or filing fees. Depending on your industry, you may need to obtain a special license, permit, surety bond, or business insurance policy, but you don’t need to complete filings with the state. This ease of setup and low cost of administration/management makes sole proprietorships great for cottage industries and seasonal businesses. If you’re just starting out in a new venture – especially one that doesn’t have substantial liability – it can be great to use a sole proprietorship until your business is established and growing. The reason why sole proprietorships are easy to set up is that owners aren’t taking the steps to formally incorporate – steps that would provide liability protection and other advantages. Sole proprietors don’t have to take these steps, but therefore give up the liability protection that comes with a formal business structure. If you’re interested in protecting your liability, it might be best to incorporate as an LLC with a service like Rocket Lawyer. They’ll help you with all state and federal filings, which allows you to legally separate yourself from your business. As a sole proprietor, you don’t pay 21% in corporate taxes on business profits the way you would in a C-corporation. Instead, you just keep filing your personal tax returns and claim any new income from the operation of your business as pass-through taxes, meaning all income is taxed at your ordinary income tax rate. Sole proprietors are also often exempt from state franchise or excises taxes. These exemptions make taxes far simpler – and cheaper – for sole proprietorships than companies like C-corps, where revenue is taxed at the company level and then a second time when profits are distributed to shareholders in the form of dividends. The dividend tax rate is currently between 15-20%, meaning that you can pay as much as 41% on your taxable business profits, which doesn’t include the income tax you pay on your salary. However, sole proprietorships aren’t the only business structures that offer pass-through tax benefits. LLCs and S-corps are both considered pass-through entities and avoid double taxation and the corporate tax rate on profits. However, even LLCs are usually charged franchise or excises taxes, depending on where and how they operate, meaning that taxes can still be higher than a sole proprietorship, depending on level of profits. Ordinary income tax – As a sole proprietor, you don’t pay yourself a salary. Instead, all profits are filed on your personal tax return and taxed at your ordinary income tax rate. Self-employment tax – If you run your own business you will need to pay self-employment tax on any income from that business, which is the employer-portion of FICA tax. This means you pay an additional 7.65% in taxes or the full 15.3-16.2% in FICA taxes. Sales tax – Depending on nature of the business, if you’re selling goods, you may need to collect and pay sales tax that varies by state but typically ranges from 6-9%. Sole proprietorships do not require annual reports or filings with the state in order to stay current. In fact, you don’t have to file anything other than your personal tax returns. This is in contrast to LLCs, S-corporations, or C-corporations, which are generally required to file annual reports after they’re formed. These reports typically require updating lists of members or managers. The absence of an annual filing for sole proprietorships is helpful not just because it avoids the headache and saves you time, but also because most states charge a fee for these annual filings that range from $50-$200 or more. Sole proprietors, on the other hand, just have to file their annual tax returns. Other, more formally structured businesses face certain limits on operations in addition to requirements they have to meet. Sole proprietorships are not subject to these requirements. If you’re a sole proprietor, it’s just you – you can make whatever business decisions you want, as long as it’s legal. There’s no formal review or approval process. In an LLC or other formally-structured business, you’re required to segregate your business and personal finances. Otherwise, you run the risk of opening yourself up to unlimited liability – this is called “piercing the corporate veil.” Among other pros and cons of a sole proprietorship, though, is that this unlimited liability is ever-present. Since sole proprietors have unlimited liability, many sole proprietors don’t segregate their financials. They deposit business income right into personal accounts, pay bills and debts personally, and handle the business basically as an extension of their personal finances. This might make operating a sole proprietorship easier than an LLC or something similar. However, while simpler, keeping business and personal finances together is not typically recommended. Keeping separate records helps you to more closely monitor cash flow in your business. The first step in separating finances is to open a business checking account. In a sole proprietorship, separating finances won’t protect you from liability, but it can help with bookkeeping as the business grows. It will also make it easier if you decide to transition to an LLC or other formal business structure. We reviewed the best business checking accounts and put Chase at the top. New customers can qualify for bonuses. 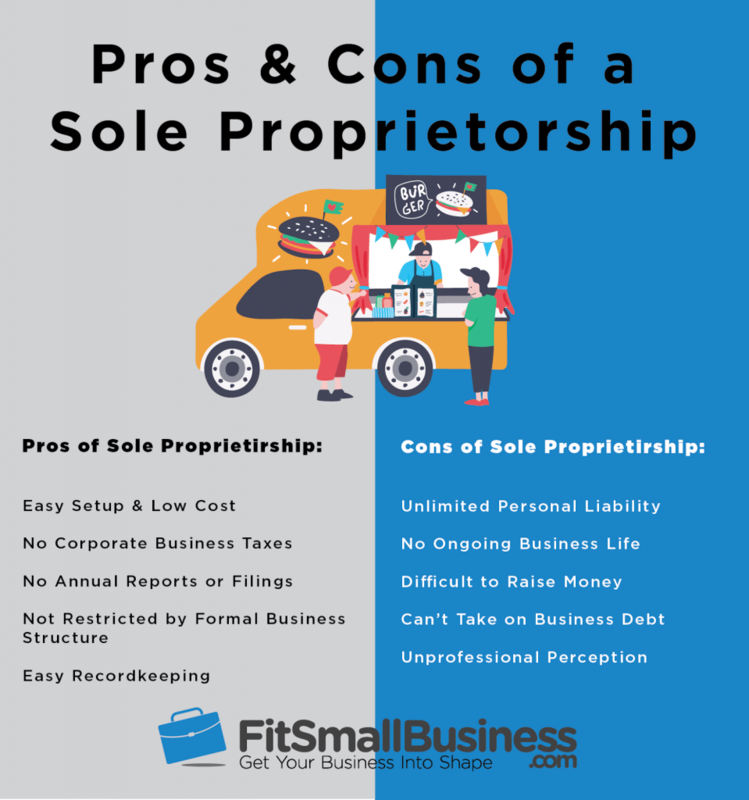 It’s important to consider sole proprietorship pros and cons. The biggest drawback is unlimited liability for a business owner, who can be held personally responsible for obligations of the business. You also won’t be able to hire W2 employees (only 1099 contract workers), which could create a significant problem if you plan on growing your business. If you’re a sole proprietor, you don’t have any of the limited liability protections offered in an LLP, LLC, S-corporation, or C-corporation. You are personally liable for all business expenses and debts, if someone’s hurt on your property, or is harmed by a product of your business or a mistake you make. This means that there is no legal difference between you and your business. Because you have unlimited personal liability in a sole proprietorship, a vendor, customer, or lender can come after your personal assets to satisfy any obligations of the business. This is in contrast to LLCs, S-corps, and C-corps, which create a liability shield between a business and its owners. In an incorporated entity such as an LLC or C-corp, the personal assets of company owners are protected. They can’t be taken by lenders, customers, or vendors to satisfy the obligations of a company unless the business owners do something that allows the corporate veil to be pierced or if the business owner knowingly signed a personal guarantee. If you need to protect yourself legally, then a sole proprietorship isn’t right for you. 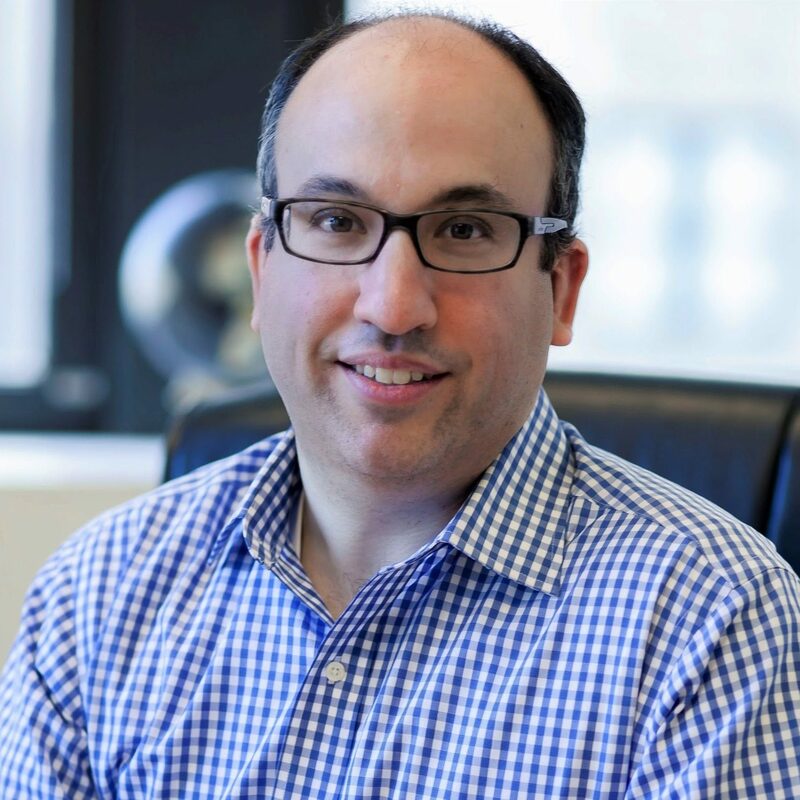 Use a service like Rocket Lawyer to help you incorporate as a single-member LLC. This should protect you from the liabilities of your company. Visit them today and you could have legal documents in a matter of minutes. If you structure your business as an LLC, C-corp, or other formal structure, and something happens to you (like death or a planned exit), the business survives. In fact, as long as you keep your business filings current and maintain proper licensing, your business can survive in perpetuity. If you’re a sole proprietor and something happens to you, however, that’s the end of the business. In a sole proprietorship, there is no structure for ensuring continuity. An employee or family member may continue in your business, but they would essentially be starting a new company from scratch – they wouldn’t really be continuing your operations. This makes it harder to plan long-term and create succession plans around your eventual business exit, if any. Further, sole proprietorships can’t hire any full-time or W2 employees. While you can still hire 1099 freelancers to do work for you, you won’t be able to run payroll and retain employees long-term. If you expect to hire employees in the future, you’ll need to incorporate as an S-corp or C-corp. To learn more, check out our article on hiring W2 vs 1099 employees. Structuring your business as a sole proprietorship is not a good idea if you may need to raise money from outside investors. This is because there’s no real business to sell, so it’s almost impossible to raise money unless you have tangible assets or intellectual property that investors can buy into. Sole proprietorships don’t have equity shares, nor are they formally-licensed businesses. There is no formal review process for business decisions or approval process. “Shareholders” in a sole proprietorship have essentially no rights. Because of these concerns, investors generally don’t invest money in a sole proprietorship. In fact, even an LLC makes it hard to raise capital, although you can make an S-corp election, which makes it easier. Still, if you want to raise money, especially investor funds from an angel investor or venture capital firm, a C-corporation is your best bet. Because a sole proprietorship isn’t a formally-established company, it’s not possible to take out a business loan. Instead, all debt – even funds you borrow to grow or operate your business – is personal debt. Lenders will require that any loans be personally guaranteed by a sole proprietor, meaning they can go after your personal assets in case of default. This is because a sole proprietorship is not a standalone business entity – you are the business. By personally guaranteeing debt for a sole proprietorship, you are committing to lenders that you will repay any loans taken for business purposes, even if the business fails. However, this might not be so different from other types of business structures. For example, even if you incorporate as an LLC, there’s a good chance you’ll need to personally guarantee any type of business loan, including an SBA loan. Be sure you fully understand your personal liability when taking on business debt. Customers and business partners often view sole proprietors as lacking professionalism. For people who just want to run a small business out of their house or make some extra money in their spare time, this may not be a problem. However, when deciding what kind of business structure you want to use, it’s worth considering the pros and cons of a sole proprietorship. 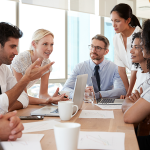 At the other end of the spectrum of sole proprietorships, C-corporations are used by many of the largest companies in the world and are generally considered to be the most professional. These types of entities have the most rigid organizational structure and oversight requirements, but they also provide the greatest liability protection and are the best for raising outside capital. Sole proprietorships, on the other hand, do not provide any formal oversight or management structure. A sole proprietorship is simply someone selling goods or hiring themselves out for work. When sole proprietors collect income, it often goes to them personally. Bills are frequently paid from their personal accounts. Sole proprietorships pros and cons make them ideal for small-scale entrepreneurs who are just starting out in low-cost, low-liability ventures. It’s also better for business owners who don’t have substantial assets that a creditor might go after if a business fails. Many people create Amazon businesses that white label existing products. You can easily do this as a sole proprietor. For more information, read our article on how to sell on Amazon. Many sellers on the online platform Etsy operate as sole proprietors to avoid the cost of setting up and administering a formal business entity. For more information, you can read our article on how to sell on Etsy. Sole proprietorship can also work for a number of other types of businesses. Independent service providers like massage therapists and consultants on platforms like Fiverr or Upwork can be well suited for sole proprietorships. Even a small neighborhood lawn mowing or snow shoveling operation can be a good candidate for a sole proprietorship. However, in these cases, you’d want to transition to a business with liability protection before buying trucks or other equipment. Moving to an LLC or S-corp, for instance, would help protect you from personal liability resulting from injury. Some small business owners choose to remain sole proprietors if their business never grows beyond a part-time pursuit or small weekend operation. That way, they can avoid the costs of registering or administering an LLC or other company. Those that grow, however, eventually choose a more formal structure that provides more liability protection. LLCs are the easiest company to form and administer. They can be created in most states online in just 5-10 minutes at a cost of $150-$200. 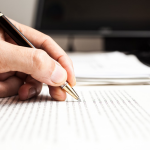 LLCs provide limited liability protection to company owners but also require annual filings, updated member lists, tax filings with K-1s issued to members, and more formal administration. Limited Liability Partnerships are only available in many states for use in practicing a licensed profession. For tax purposes they are considered pass-through entities, with tax liability being passed on to owners based on their respective ownership stake. S-corps are closely-held corporations that are generally treated as pass-throughs but also receive special tax treatment in certain areas. For instance, while the IRS does not recognize the right of LLC owners to pay themselves a salary, S-corp owners may pay themselves a salary and deduct that expense from corporate profit. For more information, read our article on S-corps and C-corps. Of the various business structures, a C-corp is the most robust and also the most costly. This is largely because C-corps are subject to double taxation, with corporate profits being taxed at 21%. Those profits are then taxed a second time once they are distributed to company owners in the form of dividends, this time at the owner’s individual income tax rate. For more information, read our article on C-corps and S-corps. Sole proprietorship pros and cons make them good for a new business owner who’s just starting. Preferably, they should be entering a field that doesn’t have much liability or require much startup capital. They shouldn’t need to borrow for the business or have a risk of injury. A cottage industry would be ideal. Sole proprietorships are also best for business owners who don’t have major assets that could be taken by vendors, creditors, or customers due to debts or liabilities from the operation of the business. This type of business is best for an entrepreneur who just wants to get their business going and then plans to transition to a more formal business structure. 1. What Advantages Does an LLC Have Over a Sole Proprietorship? 2. Why Is It Good to Be a Sole Proprietor? Sole proprietorship pros and cons can make them very advantageous for certain small or new businesses because they’re very easy to get started and very inexpensive. The unfortunate truth is that a lot of businesses fail, so starting as a sole proprietorship can be a good idea until you see whether your business is going to succeed. This is especially true if you’re starting a business that doesn’t require a ton of outside investment or entail a lot of potential liability. 3. Do You Have to Register as a Sole Proprietor? No, you do not need to register as a sole proprietor. You may, however, need to register for certain licenses, depending on your specific industry. 4. How Do I Pay Taxes as a Sole Proprietor? If you structure your business as a sole proprietorship, all you need to do is keep paying your personal taxes. If you generate any income from your business operations, claim that income and pay self-employment tax. You may also need to collect and pay state and local sales tax on any goods sold, depending on where your business is located. A sole proprietorship is a great, informal structure that has many benefits for small business owners. When deciding on a type of business structure, it’s important to consider the pros and cons of a sole proprietorship. While these businesses do not offer their owners liability protection and make it difficult to raise money, they’re also incredibly easy to establish and administer. As a sole proprietor, you can create tax and liability issues in the future if you mix business and personal funds. We recommend you get a business checking account from Chase, which offers competitive fee structures to other providers and a bonus. Get started today with no minimum deposit! I currently earn consistent annual income from capital gains and dividends from stocks, mutual funds, etf’s, etc, trading foreign currencies and futures contracts. Based upon everything I have read so far, it would be more costly and less tax beneficial to do this as a sole proprietor than as an individual. Are there any benefits to creating a sole proprietor business for this purpose and at what point might I want to create an LLC for this purpose? Thank you for your question. I’m not sure I agree with your assessment that your trading activities would receive tax advantages as a sole proprietorship. In fact, if you’re trading individually you’re basically acting as a sole proprietor right now – just working under your own name rather than a Doing Business As (DBA) or other company name. Given the nature of your activities, I’m not sure that it would make much sense for you to file as an LLC – there are filing fees and not really any tax benefits that you don’t enjoy now. You could possibly write-off the costs of trading software or a computer if you use it exclusively for trading (or part of your monthly utilities like internet if you trade from home) but you could probably do that now if you were so inclined. If you really want to enjoy tax advantages from your trading, the best way to do that is by starting to divert some of your earnings into IRAs and other tax-advantaged accounts that you can trade without incurring long- or short-term capital gains tax liability. To do this, you might want to set up an LLC and create a SEP IRA, which would allow you to contribute up to $55,000 per year or 25% of your income (whichever is less). While contributing a part of your income to an account like a SEP will allow you to grow those assets tax-free over time through more trading and investing, you will need to leave the money in the account until you reach 59 1/2. I hope this helps. If you’d like more information on SEPs you’re welcome to check out our ultimate guide to SEP IRAs here: https://fitsmallbusiness.com/sep-ira-rules/. If you’re not sure a SEP is right for you, be sure to check out some of our other articles on tax-advantaged accounts that may help you grow your portfolio balance faster.